Martin Truex Jr. is coming off a win at Chicagoland Speedway. Sign up for Globe sports news alerts. Martin Truex Jr. had a good day. On July 16, the driver of the No. 78 Toyota finished third in the Overton’s 301 at New Hampshire Motor Speedway. 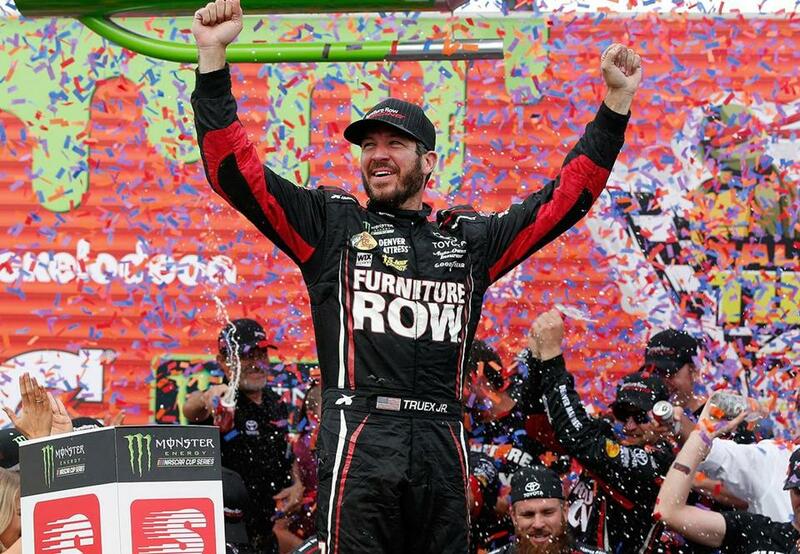 The result kept Truex atop the NASCAR Monster Energy Cup standings. He recorded a bonus playoff point by winning the race’s first stage. But two months later, the day still leaves Truex feeling unfulfilled. It was the 23rd time Truex departed Loudon without a checkered flag. Most of Truex’s competitors classify the No. 78 as the car to beat. Truex started the playoffs with a 20-point lead over second-place Kyle Larson, then put 7 more points between himself and Larson with a win in the playoff opener at Chicagoland Speedway last Sunday, giving him a get-out-of-jail-free card from the first round. “They’re doing something different than what we’re doing, obviously, and most of the other competition,” said Austin Dillon, who is 76 points behind Truex. “It’s been tough to race against them. They’ve just been that much faster at all the places we’ve been going. Truex is at his fastest in a season in which the cars are tougher to drive than ever. NASCAR reduced the downforce from approximately 2,000 pounds last year to 1,500. The vehicles are twitchy at high speeds. Drivers need soft hands and feathery feet to keep their cars off the walls. Truex now has a series-high five wins. During the regular season, he dominated stage racing by winning 18 segments, seven more than No. 2 man Kyle Busch. At the beginning of the year, Truex and crew chief Cole Pearn identified how chasing stage wins could help in the playoffs. Once they discovered the strength of their cars, the No. 78 team learned that stage wins came naturally with running at the front. “Everybody knew it was going to be important,” Truex said. “At the same time, all we do is go out there every week and try to win and lead all the laps. That’s what you do as a racer growing up. You’re driven by performance and competition. You want to be the best. Truex posted New Hampshire results while progressing on his figurative learner’s permit. He made Loudon his playground in the K&N Pro Series East when he won twice (2000, 2003) in 10 appearances. As an Xfinity Series driver, Truex won one (2005) of his three Loudon races. For whatever reason, neither those previous lower-tier Loudon victories nor Cup checkered flags elsewhere (12 over a 14-year career) have translated to a varsity win at NHMS. This Sunday could mark Truex’s breakthrough. Because of his free pass to the second round, Truex can sprint for the ISM Connect 300 win and not worry about points. Truex is enjoying an exceptional year while being an exception. Furniture Row Racing, Truex’s employer, started the season with two cars: Truex’s No. 78 and Erik Jones’s No. 77. In July, Joe Gibbs Racing poached the 21-year-old Jones. In 2018, Jones will replace 45-year-old Matt Kenseth behind the wheel of the No. 20 Toyota. Furniture Row owner Barney Visser recently sold the No. 77 charter, making Truex a one-man shop. In comparison, Jones will be one of four Gibbs pilots, joining Kyle Busch, Denny Hamlin, and Daniel Suarez. Truex, however, is not on an island. Furniture Row has a technical alliance with Gibbs and Toyota Racing Development. While Truex does not consider Busch, Hamlin, or Suarez teammates, they are driving machines that come off the same line. Somehow, Truex, Pearn, and the rest of the No. 78 crew have unlocked more performance from their Camry than their Gibbs counterparts have squeezed out of their cars. One reason for the No. 78 team’s results may be its postrace destination. After each event, most teams are wheels-up for Charlotte, the heart of NASCAR’s industry. The No. 78 team aims its plane in the other direction. Visser, a Denver native, has seen no benefit in setting up shop in North Carolina, opting instead for Colorado as his team’s headquarters. “Because they’re out there by themselves, it’s a unique deal,” Truex said of his colleagues. “They’re not going out on weeknights with other teams and other people. Other race teams are not calling up and saying, ‘Come work down here for a couple hundred more per week down the corner.’ There’s separation. Loudon is one of two first-round throat-clearers remaining for Truex before he advances to the second round at Charlotte Motor Speedway, Talladega Superspeedway, and Kansas Speedway. Earlier this season, Truex finished third and led a best-in-show 233 laps at Charlotte. A wreck left him 23 laps behind at Talladega, but he won at Kansas. Based on his lead and prior performance, Truex is a good bet to progress to the third round and perhaps set himself up for his first Cup crown at Homestead-Miami Speedway on Nov. 19. Truex is 37 years old, the same age at which Carl Edwards tossed away the keys to the No. 19 Toyota. Truex is a late bloomer. In 2015, he finished in fourth place in the standings, the first time he cracked the top 10. Last year, he finished 11th. Busch was 30 when he won his first championship in 2015. Kevin Harvick was 39 when he captured the crown in 2014. Truex considers himself at a good age at which to join such company. “I’m certainly having the best year I’ve ever had,” Truex said. “I think I’d like to take it one year at a time, see how it plays out, and go from there. Fluto Shinzawa can be reached at fshinzawa@globe.com. Follow him on Twitter @GlobeFluto.